Is there really a psychology behind success? Now you can test it for yourself in this 8-week online course. 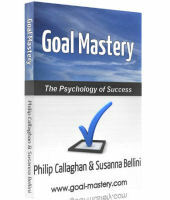 Based on Phil Callaghan’s excellent Goal Mastery book this training explores the practical psychology to achieving success. Unlike many others, this isn’t a one-size-fits-all course. The first thing we explore is what you want and what success means for you. That’s important because if you let others define success for you, you’re bound to fail – the psychology becomes stacked against you. This course hinges on the premise that achieving the success you want is something which you can learn to do. The ability to succeed isn’t born into us and need not be based on your background, qualifications or existing skills. This Goal Mastery course will guide you through a series of ideas and practical exercises designed to show you a different way of being, a clearer way of thinking and a simple means of moving towards the success you want. You will learn the simple processes that define your goals clearly, lock them in and put you on the road to achieving them. You will also learn the mind traps, pitfalls and faulty ways of thinking which hold people back – or can kill their dreams just short of success. Go here to book your place and access the material straight away.